The start of the 21st century has seen the exponential rise of computers and computer chips in more places than they have ever been before. One of the unusual places that computer chips have found their way into are car keys. Since the mid-2000’s it has been very common for car manufactures to include a computer chip inside of the car key while keeping a corresponding receptor inside of the vehicles ignition. Doing this greatly increases the security level of the automobile because it makes the vehicle much more difficult for criminals to steal. The way a transponder key works is that when the key is inserted into the ignition, the ignition must pick up the signal sent from the computer chip within the key in order for the car to start when the key is turned. This eliminates two major ways that criminals may try to steal your car. First it makes hot wiring the vehicle basically impossible and any criminal who attempts to copy the original key or one like it will not be able to start the car since the key is not properly programmed. Not all cars contain this type of security but all new cars are being built with a transponder in the key and ignition. This upgrade in security does come at price. Transponder keys are more expensive to make and maintain than a normal car key because of the technology that is involved. When a transponder key is broken and a replacement must be made there is not always an easy option. Depending on the area where you live some mobile locksmith service may be able to come to your location and cut and program your new transponder key. However, what can happen in a lot of situations, if a locksmith can not make you a new car key then you may have to have your vehicle towed to the manufacturer’s dealership in addition to paying them for the key itself. 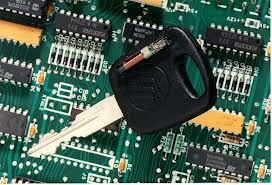 Not all transponder key issues have to result in the original key being replaced. Obviously if the key has been snapped or broke in the ignition then there is no other choice than to cut and program a new key, however if the key is still in one piece there could be other issues within the car’s ignition system. If the key still turns in the ignition but the car will not start then it is possible that your transponder only has to be reprogrammed to the car’s computer for it to properly function again. In addition to reprogramming it may not be a key issue at all. We constantly hear people saying they need a replacement key when in fact their entire ignition is what needs to be replaced. Transponder keys are the present and future of car key security and has become standard on most vehicles which are put into production today. While the transponder key does offer an extra blanket of security there is still the issue that it can be quite expensive to replace or repair a transponder key which has glitches. Finding a Reliable L… on Lost Car Keys!